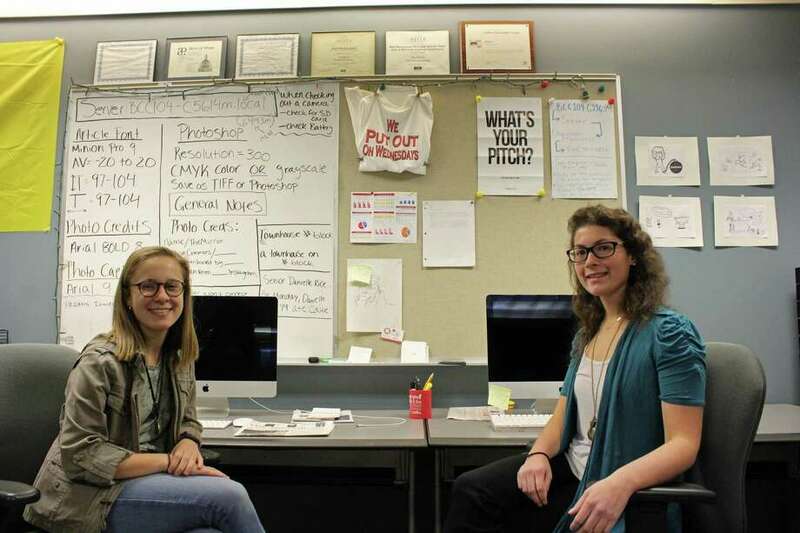 From left, editor-in-chief Ali Phaneuf and executive editor Cara Lee at The Mirror’s office at Fairfield University. FAIRFIELD — When Alicia Phaneuf and Cara Lee, two of the top three editors at the Fairfield University student paper, The Mirror, are asked if they have free time, they look at each other, pondering aloud. The question is rephrased to ask about how much time they devote to the paper each week. “I would say about 20 hours and that, probably on the lowest of weeks, is still an underestimate” said Lee, who is also juggling six classes. Phaneuf, Lee and Deanna Carbone, managing editor, were announced as the top three editors of the paper in March. Since then, they’ve been focused on expanding the Mirror’s online presence and investigative reporting. Those efforts have already come to fruition. In early October, the Mirror published a story about the Sept. 25 rainstorm that caused water damage at places like the Barone Campus Center and the PepsiCo Theatre. The piece included interviews with various students and professors, some of them who said there should be more appropriate long-term solutions for water damage. On Nov. 1, the university began efforts to repair the green roof of the Barone Campus Center and, after that is completed, to replace the carpet, a Nov. 14 follow-up Mirror story reported. Ideas for stories come from the very people the editors are writing for: the students. All three editors started out as writers for The Vine, the arts and entertainment section of the paper. Though the Mirror has had an online section, the current editors are planning to expand on that with strong articles that cover a broad range of subjects. The Mirror comes out in print every Wednesday, making Tuesday nights hectic for editors and writers. “We have to make sure the layout is good because we’re putting out content that we want people to pay attention to,” Lee said as she describes a lengthy list of details everyone has to pore over before the product is sent to the printers in Trumbull. Phaneuf and Lee reminisced about some of the bigger stories from their previous years, such as the 2016 presidential election and when the popular South Norwalk Johnny Utah’s bar was busted by police in April this year. Matthew Tullis, an assistant professor of English and digital journalism director at the university, began his role as an adviser to the students this year. And though the students are heading back home for Thanksgiving break and a paper won’t be out for next week, the editors are already thinking of upcoming stories and ideas. “I think the best compliment we have received is that more people are talking about our stories and we’re seeing an impact,” Phaneuf said.